Blink1Control is a GUI application for connecting information in your world to blink(1). It is the primary user-level application for controlling blink(1). Blink1Control is an event-based way for triggering blink(1) color patterns. Those events can be on your computer or on the Net. Blink1Control1 was the previous version of Blink1Control. It is deprecated but offered here for users who need it. Windows Installer: Double-click the .exe file to install. You may need to right-click and choose “Run as administrator” depending on your permissions and trust settings. Windows zip file: Unzip the Blink1Control folder to your hard drive, open up that folder, double-click on the Blink1Control.exe application. Mac dmg: Double-click the .dmg file. Drag the Blink1Control app to your Applications folder. 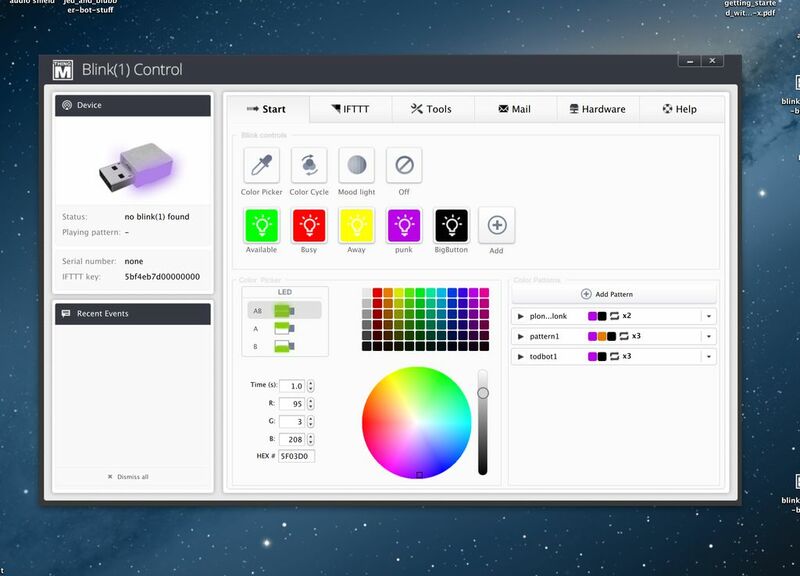 Open your Applications folder and double-click on the Blink1Control application to run. You may need to right-click on the application and choose “Open” if you receive an “Unidentified Developer” warning. Mac zip file: Unzip the Blink1Control folder to get the Blink1Control application. Double-click the Blink1Control application to run. You may need to right-click on the bundle and choose Open if you receive an “Unidentified Developer” warning. Once you install Blink1Control, start it up and start playing with your blink(1)! Note: to get more info on our downloads, see the full release page. If you have any questions, contact us via email at blink1 at thingm.com. If you have issues with Blink1Control, please submit an issue on our bug tracker.